Multiver-City One: 2000 AD Prog 2093 – Infernal Engines! Welcome, Earthlets, to Multiver-City One, our “2000 AD” weekly review column! Every Wednesday we examine the latest offerings from Tharg and the droids over at Rebellion/2000 AD, the galaxy’s leading producers of Thrill-Power entertainment. Let’s get right to it! Greg Lincoln: The fake-out implies in the closing scene of last week was very confirmed by this weeks exposition. After giving us a moment to bask in the glory of “Judge” Stan’s masterful acting, Rory McConville sets out what the Justice Department knows, well supposes, about the super powered Azure Skeletons. The way McConville sets up the Judges solution, it’s premise, it seems a solid conclusion. It relies on using the Danforth Syndicate, their desire for unchallenged dominance of Sector 11, to take on the new threat. It avoids risking Judges, it doesn’t sit well with Dredd or his partners, but it’s a good plan. It doesn’t make much sense when you realize it’s the colorful leaders of the Syndicate leaders themselves are the ones fighting this battle, but it’s the only bit that does not sit well with me in the story. Actually I would have been disappointed if the guns had worked and dulled the powers given the Skeletons. Now we are left with a worse situation and a bunch of Judges jumping into a hornets nest of danger. McConville also gives us some nice moments of tension inside the Azure Skeletons, hell even the name they have seems an issue with at least one of the members. Chris Blythe and Leonardo Manco spend a lot of the pages giving us solidly depicted action scenes. Their panels through static give exceptionally good impressions of motion. You can near hear and feel the powerful looking fans on the Judge transport that graces the opening page. The pride shows in the face of the old actor Judge Stan at his performance. The other moment that stands out are the facial expressions on the Danforth Syndicate members as the tide turns against them after the fire heavy fight that proceeds it. It’s a good continuation of what is shaping up to be a longer arc, maybe one that might carry larger plots for later. Michael Mazzacane: If last weeks strip wasn’t enough of an indication. The letter box “The Battle of Worms Landing” makes it ironically clear, this isn’t a battle it’s a massacre. Kill it with fire as they say. That sort of action is a decent twist on the kinds of actions Kek-W and Burns have been providing. With out the back and forth of a fight, early pages become a montage of destruction as Cyborg France Bacon and Wyrm Washington wreak havoc on Worms Landing. Everyone is either in a state of flight or busy being burnt down. The armored soldiers give everything a fitting oppressive grey color to everything, which is an interesting contrast to the overall earth tones Burns has normally been working in. That overcast quality makes for some interesting images as Anna, de Bergerac, Callhoun and others manage to make it to the safety of the forest. In the forest is where the strip seems to run in place for a page. With all the destruction of the previous strip, it isn’t inconceivable of spreading it out a bit into this strip. Because Callhoun’s brief flashback is boring. As a sequence it is too short to feel meaningful, and merely fills space. The bit of nostalgia is cut short, but there an uneven quality to the page overall compared to the rest that make it unsatisfying as a unit of storytelling. Reading “2000 A.D.” has made me very aware of the page budget comics operate on. These strips are all roughly 5 pages. That budget makes things like splash pages budgetary madness. And, yet, if you want to sell the idea of a giant steampunk looking killer robot that’s taller than the forest, doing it with a single splash page does the moment justice. Overall the quite moments in this strip pale in comparison to the previous one, but this is yet another excellent cliffhanger that has me waiting for the next round of strips to show up. Rowan Grover: “Appetite” has its roots in present day unlike most other sci-fi tales in 2000 AD, presenting a text more similar to The X-Files rather than Mad Max. James Peaty presents an opening chapter that essentially serves as the inciting incident for this story: a person of high-status succumbing to some unnatural disease inset by the ‘work’ of the mysterious Dr Belinda Kneale. It’s well structured, having the mystery seeded in the celebrity Amber’s dialogue with Mr Jones, our apparent protagonist of the tale. It’s also a lot of fun that the protagonists aren’t necessarily well groomed, FBI-style experts, but rather greedy entrepreneurs who happened to be in the right place at the right time. However, I find myself questioning the relevance of the opening narration. It sets up the shallow nature of Mr Jones certainly, but it’s the particular line “Who’d knew it’d end up feeling so damn hollow?” that seems off. Considering the situation that just took place in this issue, I’d say that Mr Jones has stumbled onto a goldmine of opportunity, something the very opposite of hollow. It doesn’t dampen too much from the story but just feels a little out of place in retrospect. Andrea Mutti does a great job at delivering simplistic, yet genuine emotion in this debut issue. I love how he renders a sneering and over-confident Mr Jones. The opening pages where we just get the side profile of this character sitting in a comfortable yet inquisitive manner tell us so much about his personality, especially as he leisurely leans over when asking more personal questions. Mutti also renders the degradation of Amber’s condition well throughout the story sequence. From the very moment she acknowledges her physical appearance on the second page, we start to see funny physical changes and body movements – Amber unconsciously raising her hand to cough, starting to sweat, it all makes the story believable and interesting. Eva De La Cruz also does great with colors here, providing a stark, high contrast background to go with the sleaziness of Mr Jones’ show and set. I especially love when Jones and his associate Cammy get kicked out onto the street, and De La Cruz gives the air outside a crude and almost toxic palette. Tharg’s latest story certainly has a lot going for it, with Peaty delivering a tense, high-paced script and some great pseudo-realistic art from Mutti and De La Cruz. I’m interested to see how this goes but hope that it delivers more relevant and punchy content character-wise. Kent Falkenberg: ‘True Faith, Part 2’ balances some lands-laid-to-waste-by-demons world-building with a badass mecha-monster beatdown. Gordon Rennie, Lawrence Rennie and Karl Richardson deftly shift between micro and macro threats continue setting the groundwork for this series that will soon enough be pounded into oblivion. Richardson’s art is fantastic. His scenes of the inhabitants within Lord Mechastophales are tight and cramped with detail. And they are made all the more claustrophobic by Richardson’s tendency to pull back during the outer scenes to show the immense size and and level of destruction wrought by Mechastophales’s battle with the three rock demons. The Rennies and Richardson are inching towards their greater overall story in ‘True Faith, Part 2.’ But they are doing with with a bombast and intensity that’s nothing short of infectious. Tom Shapira: This is more like it! I am still not a fan of Mark Harrison’s artistic style, there’s some interesting texture to his work but the pages are often overwhelmed by it (can someone please tell me how many aliens are in the riot scene and what shapes are they? ), but the writing is back to form (and some great lettering work from De Ville). The main focus of this chapter is the hidden distance between captain Bulliet’s outside demeanor, calm, controlled, focused, and his innermost thoughts, which hide something he does not wish to admit – neither to the squad or to himself. So this is a story about repression, about what the tough non-nonsense action hero (again, his name is “Captain Bulliet”) must go through to present this version of himself to the rest of the world. and how this version is just a mask, a mask that is about to slip at any moment. This is a subject that Dan Abnett engaged with in the past, and it takes a character type that is very cliché indeed and inject some new life into him. Abnett, as a whole, had shown the ability to take well-trodden ground (it’s not like the idea behind “Grey Area” is that original) and find a way to think through the characters and scenario in manner that takes from rote to fascinating. This strip is another strong showcase for what makes him one of the best cards in the 2000AD deck. Multiver-City One: 2000 AD Prog 2112 – Assault & Battery! Multiver-City One: 2000 AD Prog 1996 – The Fatherland! Multiver-City One: 2000 AD Prog 2094 – Annihilate! 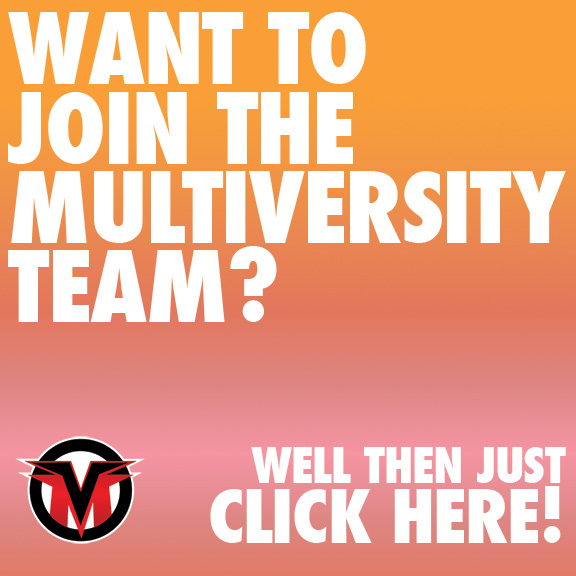 Multiver-City One: 2000 AD Prog 1958 – Did You Make A Comment, Creep? Writes for Multiversity, Sequart and Alilon. Author - "Curing the Postmodern Blues." Israel's number 1 comics critic. Number 347 globally. he / him. By day, a mild mannered technical writer in Canada. By night, a milder-mannered husband and father of two. By later that night, asleep - because all that's exhausting - dreaming of a comic stack I should have read and the hockey game I shouldn't have watched. Multiver-City One: Judge Dredd Megazine 407 – Storm Rider! Multiver-City One: 2000 AD Prog 2127 – Have You Had Your Thrill Fix? Multiver-City One: 2000 AD Prog 2126: Earth Under Siege!